In honor of Earth Day, we thought a green smoothie would be the perfect sipper to highlight for this week's Thirsty Thursday. The delicious Coconut-Kale Smoothie, from our diet and fitness blogger Tina Haupert, has all the health benefits of leafy greens (vitamin C, vitamin A and vitamin K just to name a few) hidden behind the tropical flavors of coconut and banana. In honor of Earth Day, we thought a green smoothie would be the perfect sipper to highlight for this week's Thirsty Thursday. 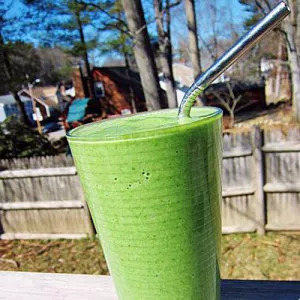 The delicious Coconut-Kale Smoothie, from our diet and fitness blogger Tina Haupert, has all the health benefits of leafy greens (vitamin C, vitamin A and vitamin K just to name a few) hidden behind the tropical flavors of coconut and banana. So even those still wary of green juices will want to indulge! To make this smoothie green in more than just color, try stopping by your nearby farmer’s market for organic, locally-sourced produce for the smoothie. Perfect for breakfast on the run or an afternoon snack, this smoothie will keep you full and satisfied for whatever your day brings!